Bond Economics: Will Treasury Bond Yields Stabilise Here? Will Treasury Bond Yields Stabilise Here? The benchmark 10-year Treasury Note yield has at least temporarily peaked out just below 3% and is now forming a new trading range. Recent strength can be attributed to a technical pullback after previous weakness, as well as some fundamental factors (choppier data, Middle East worries, Emerging Market weakness). If there is an absence of a big surprise in the upcoming Payrolls number (in either direction), or an escalation of various crises around the world, it seems likely that U.S. Treasury bond yields will stabilise near current levels for awhile. The current 5-year bond yield. The expected bond yield for the period between the maturity of the 5-year bond and the 10-year bond. This is known as the 5-year yield, 5-years forward rate. Note that I am currently approximating the forward rate using the Federal Reserve H.15 fitted interest rate series. More accurate forward rates can be generated from the swap curve, but the analysis I am doing here is essentially unaffected by this imprecision. The 5-year forward rate peaked out (on my calculations) at 4.15% on August 19 (it has since dipped below 4%). 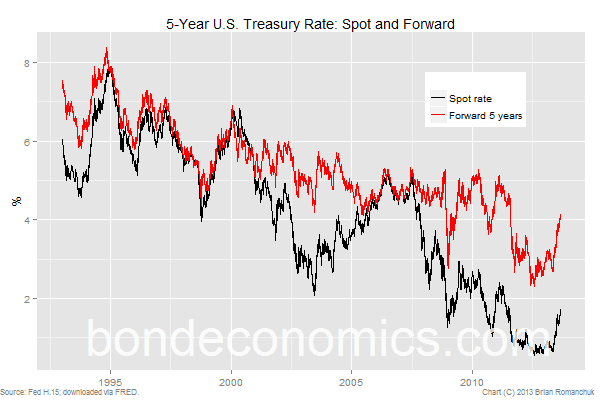 This forward rate is thus considerably higher than the peak spot 10-year yield of 2.88%. (Note that this is the Fed Reserve series, which is based on fitting the whole bond curve. This is not the same as the usually quoted 10-year benchmark rate, which is the yield of just one bond). Although a 4% 5-year yield appears low, it is actually fairly reasonable in the context of recent decades. To illustrate this, let us round off the forward yield to 4%, and try to answer the question: what are the chances the ultimately realised 5-year rate is higher or lower than that level by 100 basis points in 5 years? Although properly answering this question requires a fancy model or crystal ball, we could use historical data to give an approximation. On the basis of this admittedly simplistic analysis, if one assumes that the economic and rate environment 5 years in the future will resemble the environment of the past 10 to 15 years, one might argue that there is a very asymmetric risk towards lower realised rates*. Alternatively, although one could argue that the forward rate might seem relatively low compared to a longer history, in that past history forward rates were comically high when compared to subsequently realised rates. The amazing bond returns of the past decades were not the result of a "bubble" – they were the result of bond yields being badly priced, with an unsustainably large risk premium. Consideration of implied forward rates thus seems to indicate that there may be enough of a risk premium in bond yields currently to absorb good economic and tapering news, at least until actual rate hikes are on the table. With the consensus for rate hikes still being some time in 2015, it seems that it may be somewhat early for the market to take the rate hike threat too seriously. * This analysis should be taken with a grain of salt; there is an embedded assumption of ergodicity. Reading up about ergodicity is left as an exercise for the reader. ** To get an actually tradeable instrument, this should probably be a forward swap.